This article is a continuation of a discussion initiated in an AoD post by Naeem Mohaiemen on March 4th 2013, “History is hard work, but are we willing?” (https://alalodulal.org/2013/03/04/history/). Blogger Purboposhchim picked up on the discussion on that post and wrote another article on AoD on March 11, “Bangladeshi History: Rah Rah or Complexity?” (https://alalodulal.org/2013/03/11/rah-rah-or-complexity/). At that time I thought of writing a detailed contribution to the discussion but I didn’t have enough time. Also live history à la Shahbagh and Shapla became far more interesting and people concentrated on history in the making than the past. Now that, events have quieted down a bit and everyone is taking stock of what happened, I thought that discussion can be revived and continued in a more dispassionate manner. I would earnestly request readers who are interested in this post to go through the two aforementioned articles again but if you are pressed for time, here are few points of the discussion that are very important for the argument presented in this article. Naeem’s detailed article covers a sweeping view of the role of historical research in Bangladesh politics. For the sake of brevity, let me summarize the relevant points in a staccato manner. Naeem argues that in Bangladesh the War Crimes Tribunal and general historical research have been complicated by both lack of documentary evidence and rigorous research to unearth such evidences. From the inception, history has been politicized and commercialized. An enduring hierarchy of patronization and proscription has ensured that complexity and nuances have no place in an easy and comforting dominant historical narrative. Naeem strikingly pointed out the fact that the DU History department has not produced any Ph.D. thesis on 1971 in the last 40 years. Naeem astutely pointed out that political movements that are built on unexamined slogans can get outflanked by similar movements with more potent slogans, a scenario that we have seen played out in front of our eyes in the last couple of months. Purboposhchim particularly picks on the deshi vs bideshi divide in perspectives on Bangladeshi historical research. He argues that for different significant factors, resident researchers cannot afford the detachment necessary for objective historical research. He points out that history is a live arena of battle for the main ideological battle and no side has any appetite for any weakness in the ranks revealed through predilections for complexity and nuances. He hopes that for the country’s sake, rather than waiting for the cheerleading phase of historical narrative play itself out, historians would try to organically develop a school of homegrown detachment. While going through Purboposhchim’s article I specially became focused at the lines, “The history of 1971 is too fresh and its consequences still too much with us in Bangladesh. Just as Hollywood is still unable to give us an “uncontroversial” 9/11 or Iraq War movie, similarly Bangladesh-based academics have not been able to give us anything unaffected by “Rah Rah Nationalism”. This article is an offshoot the idea expressed in those lines. My main contention is that there is a divide between popular mass-consumption history and academic history. Even in the developed countries, history that is portrayed in school textbooks, dramatized in TV or movies, expressed in works of art, is often very different from history that is studied and analyzed in the halls of academia and published in reference heavy tomes. Unfortunately in Bangladesh, very few people can make the distinction and therefore academic study of recent history has become hostage to the ahistorical. In this article I will elaborate that idea through a discussion of arguably the most studied event in history. But before that I want to make few points on historical research. Those who are familiar with academic research methods know that there is not actually much difference among researches on social subjects like history, anthropology, social-sciences like economics and hard sciences like physics, chemistry, and biology. The same pattern of proposing hypotheses, looking for evidences, building up arguments and models, validation by further evidences, and then get peer reviewed by experts in the field, is more or less followed by researchers in all subjects. (Probably this rigorous regimen is deterring PHD’s in recent history in Bangladeshi academia). This scientific method doesn’t mean that researchers are emotionally detached with their subjects, actually academic researchers are often more emotionally invested in a particular idea or particular frame of reference than real objects or persons in their life. You do not spend decades dedicating bulk of your thinking to a subject unless you are heavily emotionally involved not only with the research subject but also with the outcome. We shall see that in the long run, the process of academic research, publication and acceptance, take care of the problem of emotional attachment or bias of the researchers. Researchers are not unbiased, they have their favorite frame of reference (paradigm) and they seek to sustain that with all-out effort. That’s why they try to support likeminded colleagues and wage battles against heretics. Thomas Kuhn 1962 book “The Structure of Scientific Revolutions” (1), one of the most influential books of the 20th century, shows in detail that how in science a particular paradigm (frame of reference or narrative) becomes dominant and is sustained by concerted politics by the paragons of objectivity, scientists. He shows that scientific research does not actually mainly stand on ‘scientific truth’ but on a consensus of the scientific community. Kuhn also showed that how this consensus is periodically overthrown by when inconsistencies within the framework become unsustainable and a new framework becomes accepted that synthesizes old theory and its contradictions. Since scientific research is much more rigid and its logical support is more quantitative and experiment based, revolutions in science occurs infrequently and with long gaps. But in social subjects, paradigm development and its overthrow is more frequent. Moreover, often several paradigms can continue side by side for a long time. The popular-academic divide is very different in history than in most other science and social science subjects. Science is same all over the world (with some exceptions, e.g. evolution!) and all nations must study the same science if they want to succeed. But history is individual for every nation and history is one of the most vital parts of common national consciousness. That’s why nations make history an edifying tool of developing national consciousness for its old, new and upcoming citizens. History as portrayed in school textbooks, popular media and art is full of lessons on struggles and achievements, heroes and villains from both common men and great. Popular history is more often not an objective study but a moral guidance of the nation. It is very different in academic history, where search for a model of objective truth is the primary goal. But as we noted before, academic research on a subject like history is not a monolithic endeavor with smooth development of a dominant narrative. In fact it is full of turmoil; new research continuously coming up to challenge a school of thought, rival camps sniping at each other with information and opinion, rival camps fighting for coveted turf on academic and government establishments. From this feverishly fermented background some narratives become dominant but they rarely remain same for long. Narratives are continuously evolving to incorporate new research and sometimes they fail and become marginalized. Thus the popular-academic divide is like a stage show where a tranquil version of sanitized history is displayed before the public but behind the backdrop furious fights are taking place to shape the scripts of the stage show. In countries where historical research is mature and resourceful, the public-academic divide is not so pronounced. Academic research continuously percolates to the textbooks and popular media. I am not a student of history but like many amateurs I have a very passionate attachment to studying history. I have an eclectic interest but the subject that gives me addictive pleasure is European history of the first part of the 20th century, especially history of the two World Wars. This is no rare addiction as any history buffs know WWII is the most studied and published event of human history and the number of research and publication shows no sign of flattening with each passing year. Since this is the part of history that I am most familiar, I now want to flesh out my argument on the popular-academic divide of history through a discussion of WWII history, specifically the record of the armed forces of Nazi Germany. In 1948, barely two years after the surrender of Germany, two American academics published a paper called “Cohesion and Disintegration in the Wehrmacht in World War II”- Edward A. Shils and Morris Janowitz (1948) (2). This paper sought to find, in the Authors own words, why “the German Army, on all fronts, maintained a high degree of organizational integrity and fighting effectiveness through a series of almost unbroken retreats over a period of several years”. This paper played a big part in setting the tone of academic research on WWII military history for the subsequent decades. This was the period when the world’s disgust with the Nazi regime was at its peak with rubble in Europe still smoldering and smell of Gas Chambers still raw. The total revulsion with the German cause and its way of aggressive war did not stop historians from striving to analyze the Nazi regime and its war machine with objectivity. There was also an urgency of necessity. Allied military strategists and researchers had internalized the judgment that the German Army has demonstrated superior military performance against overwhelming odds. Since the developed world quickly transition from a hot WWII to a Cold War confrontation and military build-up continued apace, the erstwhile enemies became eager to learn the lessons on military effectiveness. No nations overtly expressed this eagerness to assimilate the tools of trade of the German Army more than America. As the military found itself the new No 1 global super power and as the US academia became swelled with émigrés from Europe, historical research in US took off like all other subjects. In the 1950’s and 60’s several strands of history writing became discernible. In the ’50s lot of memoires by famous generals like Eisenhower, MacArthur and their personal papers were published. Based on these memoires and official papers, historians like Charles MacDonald, Martin Blumenson wrote books that were regarded as official histories of US military(3). These books inevitably put American military performance in positive light by portraying US generals as sagacious leaders and citizen soldiers as heroes capable of overcoming any challenge thrown by the enemy. 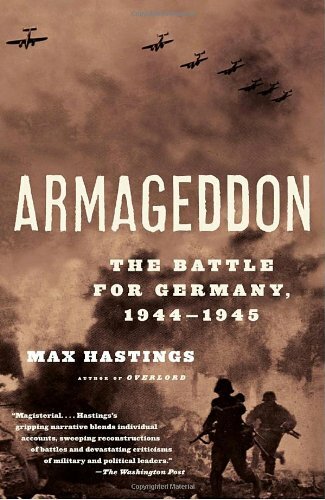 At the same time some other heavyweight historians like Chester Wilmot, Samuel P. Huntington put the German Army combat performance on longstanding German military tradition and compared it more favorably that Allied armies(4). Meanwhile researchers under the auspices of US Army were busy analyzing German Army documentary records, debriefings of German officers and soldiers and German military literature. The primary motivation of these researchers was to unearth the secrets of German Military success and apply them to develop US military doctrine. These studies generally concluded that the German army at the tactical level was much more imaginative, agile and ready to take initiatives. These studies generated famous theories like Observe, Orient, Decide, and Act cycle (OODA Loop) in the 60’s(5). As the military theorists and strategists became alarmed at the lackluster performance of US army in Vietnam and general Soviet military buildup under Brezhnev, study of German military of WWII gained a new impetus in the 1970’s. 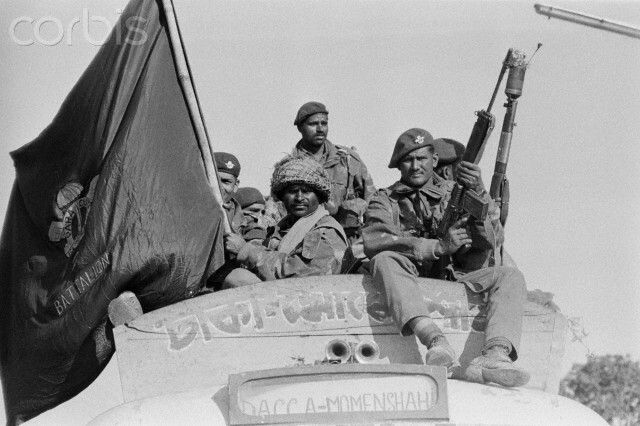 Military history in the 70’s and 80’s were dominated by examination of tactics and quantitative analysis. One of the most influential books during this period was, “A Genius for War: The German Army and General Staff, 1807-1945” by Col. Trevor N Dupuy (6). Using combat reports and quantitative analysis, Col. Dupuy showed that even in the dying months of the war the German army was demonstrating marked superiority over its American, British and Russian counterparts. A plethora of books in the ‘70s and ‘80s elevated the German army from a role model to an object of veneration among strategists and historians. The US army unveiled its new military doctrine in 1982, FM 101-5 (AirLand Battle) which was but refitting the German Blitzkrieg to cold war setting (7). So dominant was the admiration of German Army performance in military histories of 70’s and 80’s that a backlash began to brew. An historian of the counter-school ridiculed the naked admiration of German Army at this period, “The fetishizing of German fighting prowess has become a staple for many major historical studies of the Second World War, with the German Wehrmacht being regarded as the greatest military organization in modern history. It has become a commonplace argument that the Allies triumphed only through the weight of materiel and manpower they succeeded in assembling; at a tactical and operational level the Germans are frequently viewed as intrinsically superior” (8). I will come to the backlash later. The point of interest for this article is that throughout 50’s, 60’s and 70’s, in hundreds of Hollywood war movies, in popular books and magazines, the general people got a very different impression of the war. In these public media the German soldiers were inevitably portrayed as rigid automatons whose principal military skill seemed to be stopping bullets with their bodies. The American and Allied soldiers were, on the other hand, depicted as individuals with bravery, skill and imitativeness. Popular books and magazines extolled strategic genius of famous Allied generals like Patton, MacArthur, and hailed them as great titans of military history. The popular-academic divide in history was never so stark. Alarmed by the US military establishment’s growing ‘fetishisation’ of the Wehrmacht in the 70’s and 80’s, a backlash began brew among some US military historians. Some historians challenged the quantitative analysis methodology pioneered by Col Dupuy and other historians working in US war colleges. While other historians researched and collected combat experiences of frontline Allied soldiers and tried to show that their combat performance was as good as if not better than the enemy. The most famous name among the second group of historians is Stephen E. Ambrose, who became the most celebrated historian in the 90’s because of his bestselling books on soldier’s experience(9). He was an accomplished historian in the 60’s and 70’s but later on decided to write histories that was best described by a NT Times article as, “Mr. Ambrose’s interest had turned to stories of triumphant heroes with few moral or historical ambiguities”(10). He was the military adviser on Steven Spielberg’s movie on Normandy Landing, “Saving Private Ryan”. 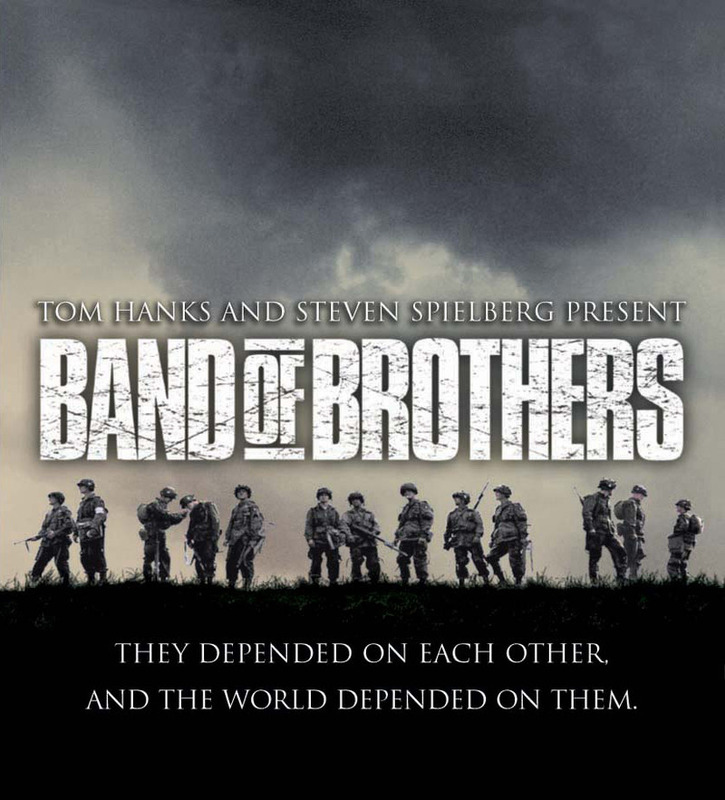 His book, “Band of Brothers”, was made into a famous TV miniseries produced by Spielberg and Tom Hanks. This kind of rah rah books and movies, while regularly topping NY Times bestseller list and becoming blockbusters, were often dismissed by other historians who preferred more complex analysis. Later on, Mr. Ambrose was found to be guilty of plagiarism in some of his books and his reputation among historians suffered further blows (10). WWII has grip on the imagination of English nation perhaps like no other people. In the traumatic 20th century, where within a course of five decades Britain reduced from the premier global empire to a “a small island off the coast of Europe” (11), Britain’s lonely stand against the Germans from June, 1940 to June, 1941 is regarded as “the finest hour” of British history. WWII is a living event for the English people, there is not a day when some kind of reference to it is made in mainstream media. In the decades following the war, glorious tributes to the leaders and soldiers of Britain were regular feature in popular media, books, comics etc. Given the British obsession with the two WWs, it’s not surprising that British historical research on that period of the history ranks very high in both quality and quantity. Immediately after the war, history writing was mainly dominated by memoires of leaders and generals like Churchill, Montgomery and official histories. These were as usual self-serving but there was an enormous appetite among military history enthusiasts to know why the British arms failed so badly against Germans in the first three years of war. This appetite was fed by two famous British military theorists Basil Liddell Hart and J.F.C Fuller. With materials gathered from ex German generals, they produced works that explained that while the German Army thoroughly internalized British military theory of the interwar years (1919-1939), the British Army ignored them in war operations at dire cost. For a long time this was a dominant narrative in British and in general western history research. But later several renowned historians, among them John Mearsheimer of University of Chicago, showed that Liddel Hart and Fuller were exaggerating their influence on German military doctrine to burnish their own reputation (12). Historians now more or less agree that the German way of maneuver warfare and mission tactics were natural evolution of more than a hundred years of Prussian Military tradition. There are several schools of British military history that have become distinctive in parallel since the 1970’s. One school of thought is very scathing on operational strategy and combat performance and identifies British general economic and industrial decline as a prime cause. Historians like Correlli Barnett are the most famous names in this tradition. 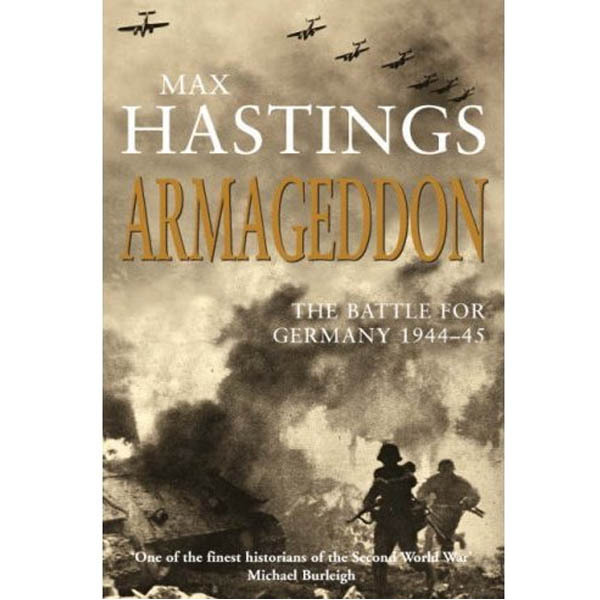 Journalist-historian Max Hastings has become very prominent in recent years as a critic British leadership and admirer of the Wehrmacht(13). A more middle of the road approach is taken by historians like John Keegan, who, while praising German combat performance, concluded that citizen soldiers of democratic countries like USA, Britain, Canada, showed adequate skills and bravery for overcoming their totalitarian enemy. A less known school of historians, meanwhile, have been doggedly trying to rehabilitate British combat record. Postwar Germany had very clear reasons to be ambivalent about the military history of its armed forces in WWII. On the one hand almost the whole nation participated in an excruciatingly bitter struggle against all the major powers of the world while on the other hand its political leadership perpetrated the worst atrocities in human history. The recurrent theme of the postwar military memoires and histories was that while the Nazi political organizations like Gestapo and Nazi armed forces like Waffen-SS, SD, were directly involved in Holocaust, civilian massacres and atrocities, the professional German Army, the Wehrmacht, fought cleanly and honorably in the war. In the 50’s and 60’s this view was vigorously promoted by West Germany’s political and military leadership. As the newly constituted German Army, Bundeswehr, became the main bulwark of NATO against Warsaw Pact, it became very important to shield the new armed forces from the stigma of the Nazi regime. Eager to rehabilitate West Germany among the democratic nations, the popular media also participated in developing this picture of officers and soldiers of Wehrmacht conducting as professionally as they could under a virulently evil Nazi leadership. Historians in USA and Britain also supported this view by generally giving Wehrmacht a clean slate military conduct-wise. In the late 60’s West German historians got access to the archive of Nazi official documents captured by the allies. Detailed research on millions of pages revealed that the army was very much embedded with National Socialist ideology and were complicit in many atrocities against civilians, especially on the Eastern Front(14). Later historians like Omar Bartov (Hitler’s Army: Soldiers, Nazis, and War in the Third Reich, Oxford University Press, 1991) showed that intensive ideological indoctrination was a big factor in the famous unit cohesion of German military units as depicted in Edward A. Shils and Morris Janowitz seminal 1948 paper (15). The main components of this indoctrination were intensely fostered racial superiority, dehumanization of enemy and a religious deification of Hitler. Today it is generally accepted in mainstream history that while the Wehrmacht’s combat excellence cannot be belittled, it was also a willing practitioner of criminal Nazi ideology. Since documentary evidence, eyewitness records, secondary research etc. are so widely available, historical research on recent events (events taking place within living memory or roughly 100 years) is always in a state of flux. Moreover documents, eyewitnesses and researches cannot always be relied on as representative of facts. So there is always room for new interpretations, refutations and propositions. This state of flux in research is very real for epic events like WWII. There has been a paradigm shift in military research in the last two decades. Previously it was commonly accepted that while the Eastern Front was vital in defeating the Nazi war machine, the Russians only won their victory by sheer weight of numbers and through very generous material help from the western allies. The cold war divide naturally fostered an environment where Russian contribution was belittled. German generals and historians were also very willing to support this view of Germany fighting gallantly against communist hordes. Hundreds of popular history books, novels published in Europe and America in 60’s and70’s supported this view. In the 1990’s, after the fall of Soviet Union, Russian military archives gradually opened up for western researchers. The archives are so huge that researchers have not yet finished looking into all documents. But already many startling information have been found that has transformed military history of the war. US military historian Colonel David M. Glantz has established himself as a leading western authority on the Eastern Front by virtue of his work with the archives (16). Historians have found out that after suffering tremendous losses from the German invasion in 1941, the Russian Army did not have an overwhelming advantage in men and materials over the enemy in the battles fought in 1942 and 1943. This was the period when the decisive battles like Stalingrad and Kursk were fought. Opening of Soviet archives have shown that the fighting in Eastern front was bloodier and vaster in scale than previously known, with several unknown battles on the scale of Stalingrad completely absent in the history books until now. New research by German historians like Rüdiger Overmans in the 1990s has also showed that German war death was higher than previously estimated (17). Roughly 5 million German soldiers died in the war, 80% of whom died in the Eastern Front. But there the vigorous debate about number of war dead is still continuing, with many disputing research of Overmans(18). Today most historians agree that although Russia suffered horrible losses in the war (13 million military deaths, 20 million plus civilian deaths), it also largely destroyed the German Army on its own. 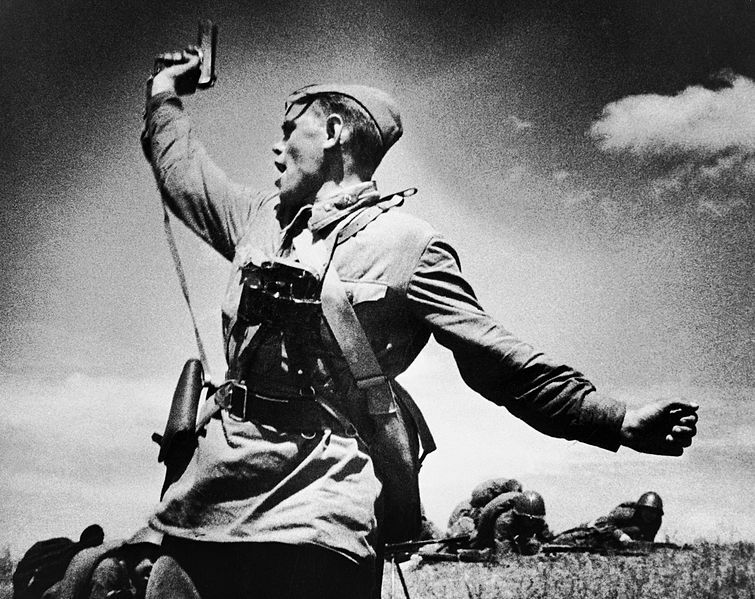 Soviet officer leading his soldiers in attack in a battle in Ukraine in 1942 just before getting killed. Once you start on your favorite subjects, it’s hard to put on a break. The point I am trying to make through this rambling review is that history as portrayed in the popular media and history that is studied in academia is often very divergent. Behind the façade of certainty and moral clarity of popular history, academic research of history is full of controversies, ambiguities and rivalries. Since recent history is part and parcel of politics in nearly every country, outside influence is also heavier in history study compared to most other subjects (except economics perhaps!). People’s motives are naturally suspect in history study; it becomes abundantly clear than many researchers are more than sympathetic to a particular side or ideology. But the quality of research is not debated on the motive or intention; it is debated on virtue of rigor, methodology and evidence. Out of these debates some narratives began of gain acceptance over the wider research community. Overtime, these debates also permeate the popular version of history too. In Britain, for example, the moral doubt about area bombing campaign of 1943-45, targeting civilian population of Germany is widely discussed in popular media and school textbooks too. Western popular history now also accepts that Russia made the principal contribution in defeating the German war machine. History can never be the reality. It is impossible to know what exactly transpired in events that happened with millions of people participating for a long period. Just as science never claims to be the expression of real nature but the best model of nature, history can only claim to be striving for the best representation of what really occurred. Politics, debates, controversies, refutations, syntheses are integral part of the process for getting ever closer to what really happened. The healthy environment of academic research does not idolize detachment and objectivity, it holds the process of dissent and debate as sacrosanct. If the process is robust, detachment and objectivity are natural outcomes in the long run. If we try to keep at the chaotic part of historical research by stiffing debates and dissents and by dogmatically holding on to a sanitized version of history, we may sometimes get rude shocks. Like waking up to find that more than half the country is Anti-Liberation! (15) “Hitler’s Army and Nazi Ideology: An Exploration into the Wehrmacht of the Third Reich” Mackenzie Weinger (2008). Nothing short of brilliant. 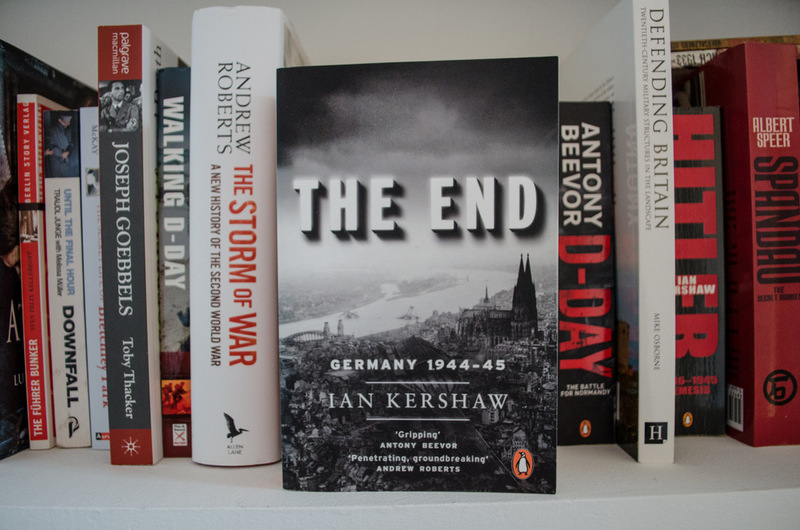 Thanks to Mr. Shafiq – especially for the overview of how WWII history was shaped (its difficult for readers like me to sift through the vast archives). How it relates to our own history, while stated only briefly, makes perfect sense. Some years back, a friend dismissed F.R. Jacob’s ‘Surrender in Dacca’ as inadmissible even in informal discussions …because “Indians had vested interest in ’71”. Yet, when groping around in the void that is ’71 history, I had found Jacob’s account to be quite informative (and yes, a bit self-serving too). Even if we are unable to immediately reconcile popular and academic histories – the mere fact that we can now read articles on the phenomenon indicates progress. Thanks again to the writer. The politicization of history is not unique to independent Bangladesh. It seems, from the discussion, that it might make sense to contextualize how history is treated in Bangladesh in the broader context of how history has been dealt with in the subcontinent and in the British empire (and globally).